Shapiro Tax Consultant is an authorized IRS e-file Provider. This allows us to file your return electronically to the IRS for processing. The process is seamless and efficient. Once your tax return is prepared, it is electronically sent to the IRS. When the IRS receives your return, it is automatically checked by computers for errors or missing information. If there is an error or missing information, your return is sent back for clarification and resubmitted. Within 48 hours of submission of your return, the IRS send confirmation of acceptance for processing which is your proof of filing. If you are due a refund, it typically takes only about five to ten days to receive if you use direct deposit. If you owe money, you can take advantage of the electronic payment options offered by the IRS to assure timely payment. New Client Special - For a limited time, all new clients save with a special offer on our tax preparation services. 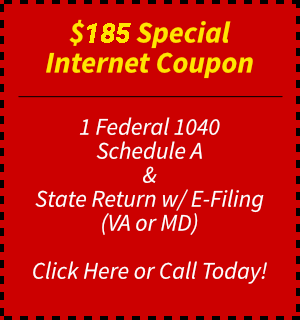 We will prepare and individual Federal Form 1040 Schedule A and one State of Virginia or Maryland tax preparation return for only $140. (States other than Virginia or Maryland are slightly higher). E-filing is subject to the actual costs associated to submit your returns electronically. For fast service on your tax needs, call (703) 978-3296 today or Contact Us Online for quick answers to your questions, to schedule an appointment or for additional information on emailing, mailing or faxing your information.